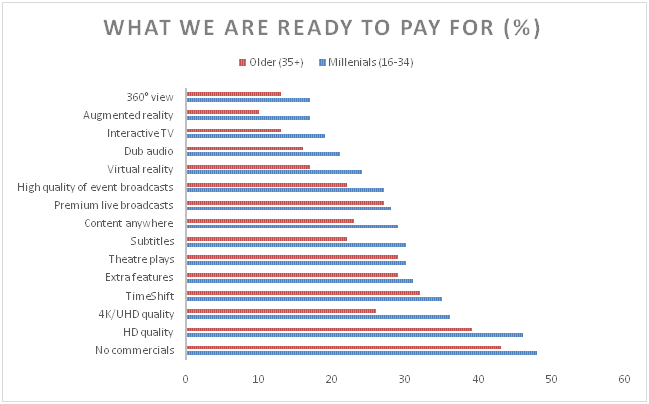 Home » Technology » Why People Are Ready to Pay for TV? Why People Are Ready to Pay for TV? Watching videos for free “illegally” is an attractive alternative to paid services all around the world. Nevertheless, consumers agree to pay for extra features that cannot be found on “pirate” sites.Ericsson ConsumerLab conducted the survey which shows what can be attributed to those advantageous details. Based on it, you can choose the most attractive content provision service for your clients. According to Ericsson ConsumerLab, interactive TV, dub audio, VR and events broadcasts get the least consumers’ demand (19-28%). They are not so popular, but their share is still sufficiently big. Theatre plays, subtitles and extras are a little more important for subscription decision making (30-31%). And the TimeShift feature is valuable for 35% of TV viewers of the world. First three positions in survey rating are occupied by 4К/UHD quality (36%), HD quality (45%), and no commercials (48%). These most popular parameters can be attributed to “comfort” category. People don’t want to be disturbed while screening and want it to be pleasing. Main qualities that people are ready to pay for are all combined in IPTV format. If you choose right IPTV set top boxes, you will be able to provide 4К/UHD video (HD goes without saying). Commercials switch-off and postponed playback (TimeShift) can be set up owing to the software running the IPTV project – middleware. Although the victory over the “pirates” is yet to come, convenience when watching TV or a film will be always in favor. And IPTV services accumulate all those features viewers are ready to pay for. So if you are planning to catch up in a moment and to start providing demanded IPTV/OTT services or if you are already a provider you need to pay special attention to your client equipment software and hardware. You’ll need a powerful processor and an appropriate RAM to playback high resolution video. You’d also make sure that your equipment has HEVC or at least MPEG-4 support to make this video not to load the network. Most of content-related features may be set in middleware. So their availability depends on quality of the code. Flawless operation is usually provided by commercial middleware or free ones made for specific set-top boxes as a part of complex solutions provided by some set-top box manufacturers.